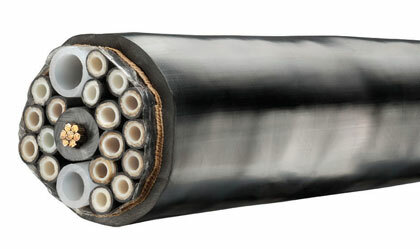 Umbilical's are groups of hoses and sometimes electrical cables, either cabled at (360°) or layered in a round or semi-round configuration. The outer wrap (cover) will have a specified Urethane or PVC jacket custom made for the customer's umbilical application. At Kuriyama, we continually focus on innovative, cost effective solutions to meet our customer's requirements. We have a team in place with combined experience and success in both hose and umbilical manufacturing to meet your needs. Click here for more info.